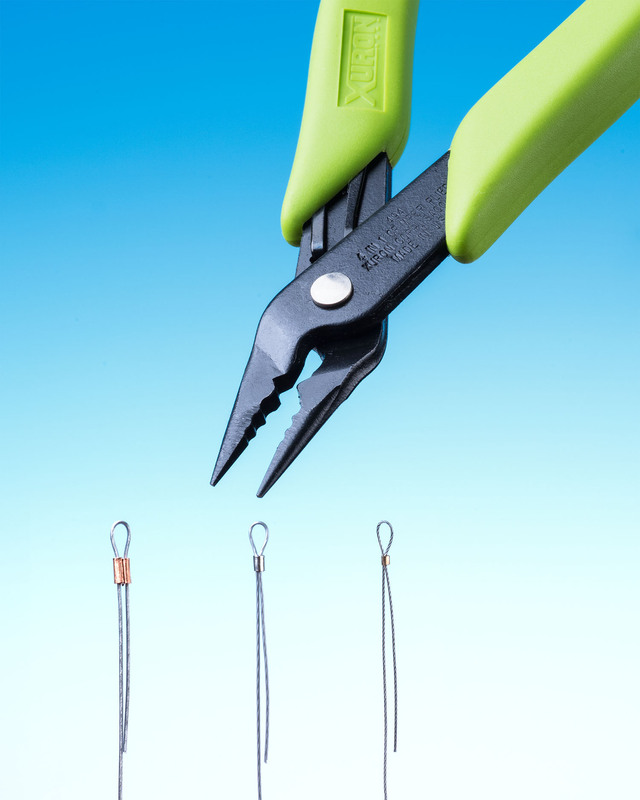 A versatile crimping plier for beading and jewelry making that crimps and folds 1, 2, and 3 mm crimp tubes and includes a chain nose pliers tip for handling small beads, wire, and findings is available from Xuron Corp. of Saco, Maine. The Xuron® 4 in 1 Crimper is a precision tool that features three folding stations for 1, 2, and 3 mm crimp tubes and includes a chain nose plier tip for holding, squeezing, opening loops, and picking up beads and findings. Easy to use, just place the crimp in the crimping station and then squeeze, turn the crimp on its side and place it in the appropriate size folding station and squeeze again. Then use the plier tip as desired. Especially designed for beading, jewelry making and repair work, the Xuron® 4 in 1 Crimper is made from hardened steel with a non-glare finish that is easy on the eyes, soft Xuro-Rubber™ handles, and a built-in return spring. Comfortable to grip and use, this bead crimping tool with the chain nose plier tip eliminates the need for multiple tools. The Xuron® 4 in 1 Crimper sells for $21.95 (sugg. retail) and is made in the U.S.A. Literature is available at www.xuron.com or upon request.